A good friend of mine had been feeling unwell for some time, being almost constantly short of breath. His Doctor could not identify the underlying cause, so sent him to the hospital for a range of further tests. These were designed to impose increased stress on various physiological functions and measure the responses. During the course of the tests quite suddenly my friend collapsed. Fortunately, being in hospital they were in the best place for an emergency and the problem was identified and successfully treated, but an alarming episode nonetheless! There are parallels here with your I.T devices. 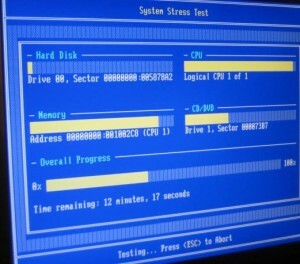 When you ask us to do a health check or fault finding on your computer, we first have to run diagnostic routines, which will in effect “stress” the various internal components to evaluate how well they are performing. If one of the components is not in good health and/or operates at the margins of failure, induced stress may indeed be the final straw which causes a serious failure. Indeed, serious failure is often the only measure by which we can accurately identify a fault! This is a risk we ask to you to be aware of before we start work and remember if this should happen to your beloved computer there is no better place than the Blue I.T “Hospital” to restore things to glowing good health. However, these issues can often make things seemingly worse before they get better and add time and expense to any given job and these are both things to take into consideration when your Desktop PC or Laptop Computer needs attention. Things may often seem simple, but thorough diagnostics can reveal other underlying issues or failures which need to be dealt with first! As a final note please do follow us on Twitter and Facebook and or leave us a review or testimonial on Google+ or Facebook if you have used our services in Bude for your Desktop PC or Laptop Computer repairs or advice!